charging station, developed in conjunction with Nissan to provide ultimate flexibility. "We are very proud to be the first in Italy to introduce zero-emission taxis with our Nissan Leaf. Thanks to our experiences abroad we have no doubt about this being the ideal vehicle for Taxi operators," said Bruno Mattucci, Nissan Italy Managing Director. "Moreover, the Nissan quick charging station makes battery recharging easy and convenient. With zero emissions and ultra-quiet running, electric taxis make life in the city better for citizens, tourists and taxi drivers." Nissan Leaf has been in use as taxis across Europe in Lisbon, Amsterdam, Newcastle and Barcelona. Taxi Electric in the Netherlands have already covered over 1.5-million km on its Nissan Leaf fleet, with zero mechanical breakdowns or flat battery situations. 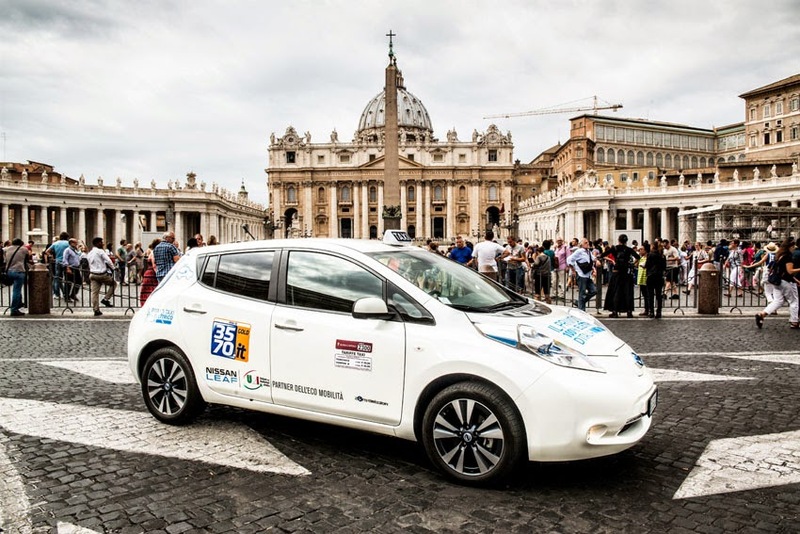 The goal of the partnership between Nissan and Unione Radiotaxi of Italy is to transform the taxi service in Rome, where traffic conditions are tough and the air quality poor, to be cleaner and more sustainable. The agreement also includes the installation of a static Nissan CHAdeMO quick charging station in the HUB of Taxi 3,570 at Fiumicino Airport. The CHAdeMO quick charger is able to recharge vehicles from 0 per cent to 80 per cent in less than 30 minutes.